Merry Christmas, dear readers! I hope you’re all having a wonderful time celebrating with dear ones. We celebrated yesterday (as is customary in Sweden) and I will tell you all about it later, but thought I would post a quick cocktail recipe – perfect to make any leftovers feel a bit more festive! I made this for the book club Christmas dinner, and we all loved it! It feels wintery and festive without being to sweet. I also made star-shaped canape’s with puff pastry, blue cheese, walnuts and honey and they always go down a treat. In a pestle and mortar, mix together the rosemary and sugar. Mix the rosemary sugar with the juice. Divide between glasses. Fill up with prosecco and add some tonic to finish. Serve straight away. 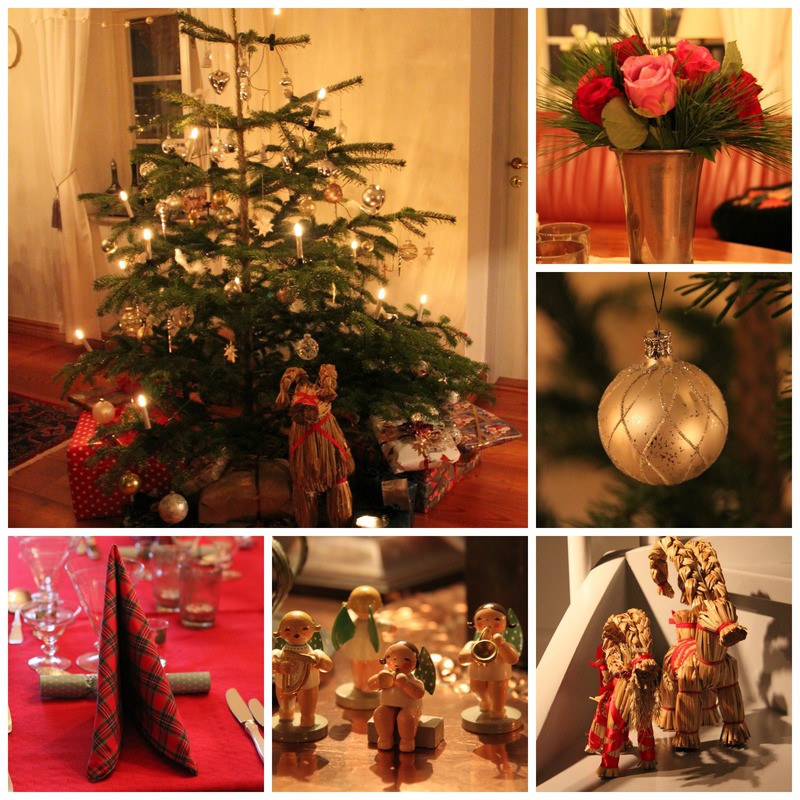 In Sweden Christmas Eve is the big day. Christmas day is for going clubbing (no thanks! ), early sales (again, no thanks!) and just chilling (much better). In my family we open the stockings on Christmas Eve morning. Christmas stockings are not a Swedish tradition, but my family thinks it’s nice and cosy. But we only open a few presents in the morning as Father Christmas always comes by in the evening with a sack full of gifts (no chimney action in Sweden). Then at 3pm, the whole country is glued to the television watching Donald Duck and other Disney cartoons. It sounds silly, but it’s one of the fundamentals of a Swedish Christmas Eve. Then in the evening, probably after coffee and cake while watching Donald Duck and then glögg and gingerbread a bit later, it’s time for dinner. In most families this comprises a julbord; a smorgasbord with lots of Christmas food, like herring, smoked salmon, cooked ham, meatballs, sausages, cabbage, sprouts, Janssons temptation, patés, ribs etc etc). 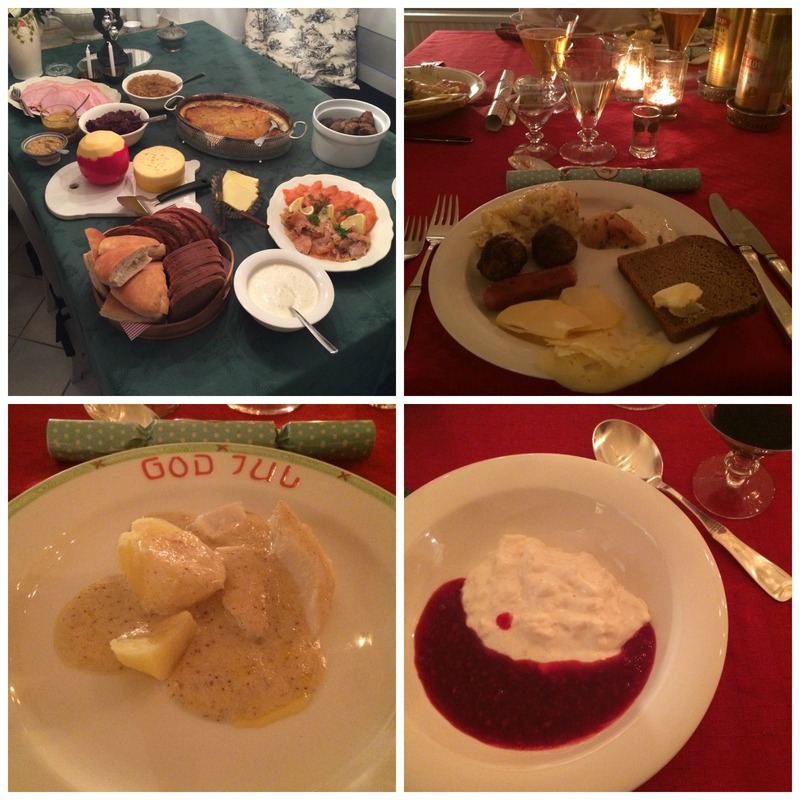 We took an alternative route this year, stepping away from the traditional heavy food, and instead enjoying, a still festive, and a little Christmas-y, menu. Our evening began with prosecco and these lovely parmesan biscuits, then Toast Skagen as a starter followed by halibut and boiled potatoes, cooked peas and the most heavenly sauce for fish for mains. This alternative approach to the Christmas dinner suited my family perfectly. It felt festive (more festive than ham, cabbage and meatballs actually) and even though the food was still on the heavy side it’s nothing compared to the julbord. The month of December was busy to say the least. So much so that I didn’t have time to update you on the blog on what I was up to. One Sunday I had a bunch of friends over for drinks and canapés, some Christmas themed, some not. Some of my friends have dietary requirements that I catered for and it was a bit of a challenge to cater for a vegan, a coeliac and pregnant ladies all at the same time, but I seemed to pull it off! We started with prosecco (and alcohol free alternatives) and savoury canapés. One one table I had made a little blini buffet that my guests could help themselves to whenever they liked. That way I wasn’t too stressed sending out trays of canapés. 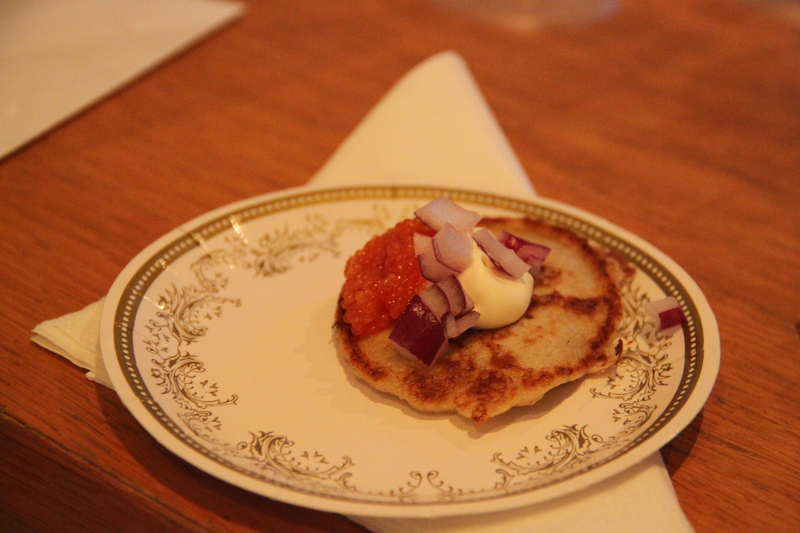 At the blini station I had proper homemade blinis, glutenfree pancakes and vegan pancakes as well as lots of toppings (cured salmon, creme fraiche, caviar (not the fancy stuff), chopped onions, aubergine ‘caviar’ and marinated beetroot). 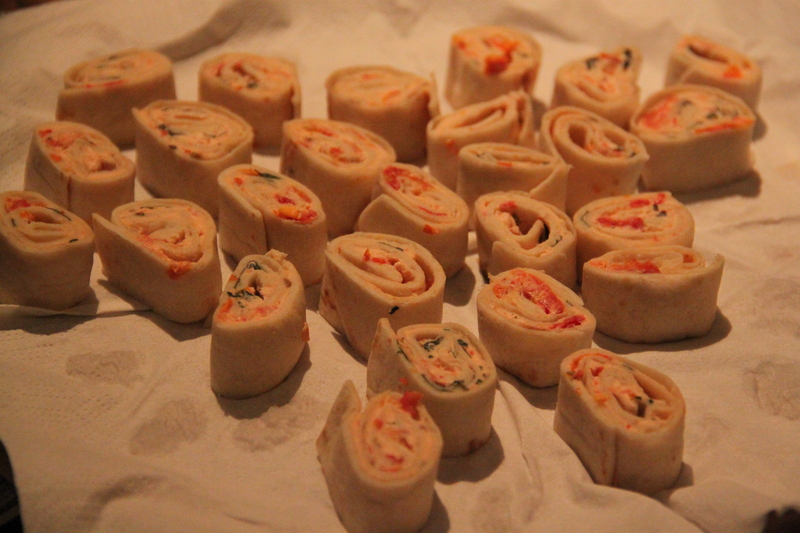 The first savoury canapé was these rolls with cream cheese, sunblush tomatoes and basil. So easy to make ahead of time. 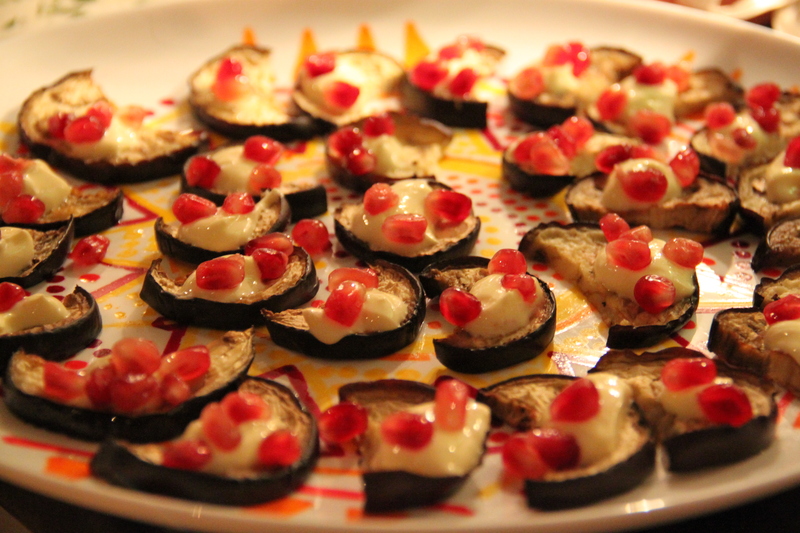 Next up was baked aubergine with saffron yoghurt and pomegranate seeds. 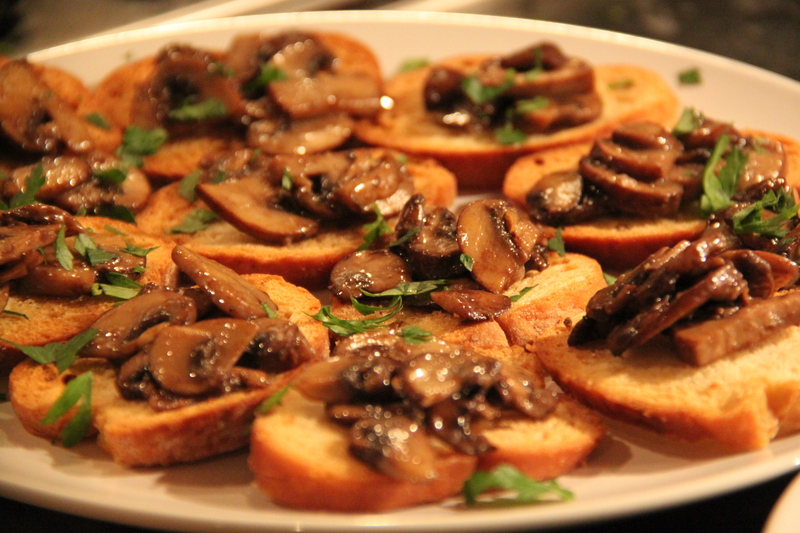 Vegan truffled mushrooms on crostinis – recipe to follow later. 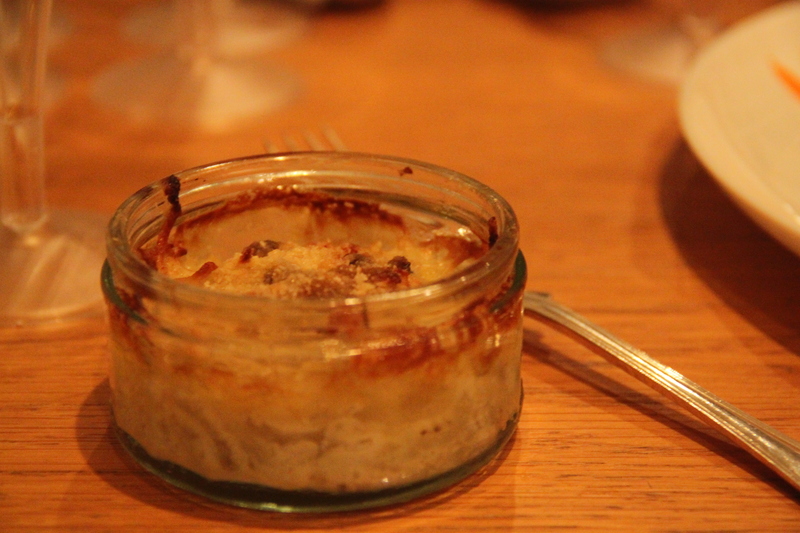 And lastly, warming pots with Jansson’s temptation, a classic Swedish Christmas dish consisting of grated potatoes and onions, anchovies, cream and breadcrumbs on top. I love that all mu non-Swedish friends adore this. Most of my guests had two each! In the transition from savoury to sweet I replaced the blini station with gingerbread (regular, vegan and gluten free ones) with Stilton, sweets, chewy chocolate cake (including a vegan and gluten free one that didn’t turn out very well). Jenny brought some vegan mince pies with filo pastry that were put out too, they were delicious! And of course, we had some homemade glögg (sweet mulled wine) with the gingerbread. 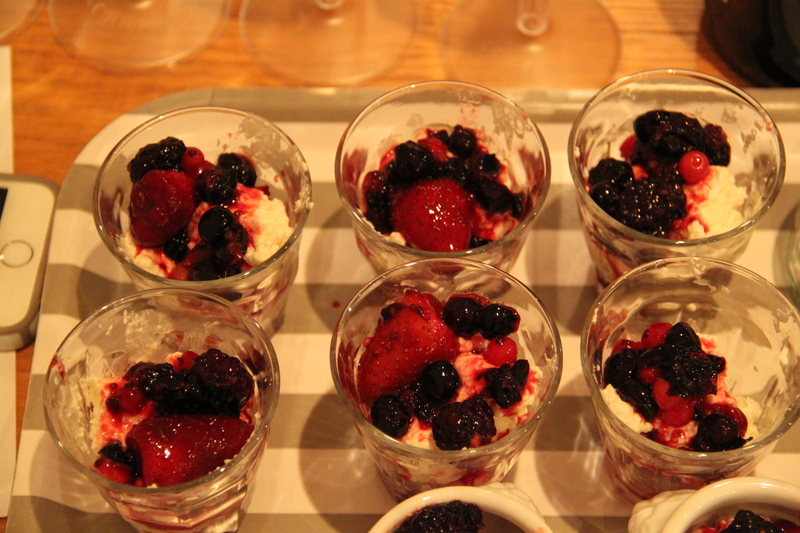 Lastly I brought out rice pudding the way we eat it on Christmas Eve; cold and mixed with whipped cream. I served it with defrosted berries mixed with some icing sugar. I had so much fun at this gathering, and I hope my friends did too! Preparing most of it ahead of time meant I could mingle and drink prosecco like every body else. This saffron cheesecake would be considered christmassy in Sweden, where we use saffron mainly for the holiday season (apart from in fish soup), however in the rest of the world it would probably just be a nice cheesecake with saffron, which is why I’m posting it post-Christmas (well that, and the fact that I didn’t have time around Christmas). Mix the digestives into crumbs in a food processor, add the butter and press onto the base of a Ø 20-25 cm springform and pre-bake for 10 minutes at 150 C.
Meanwhile mix the cream cheese with caster sugar in a bowl. Heat up the milk with the saffron and add the gelatine. Leave to cool a little and mix in with the cream cheese. Lastly, mix in an egg and pour the filling into the tin. Bake for 20 minutes in 150C oven. It should still be quivering in the middle but set otherwise. 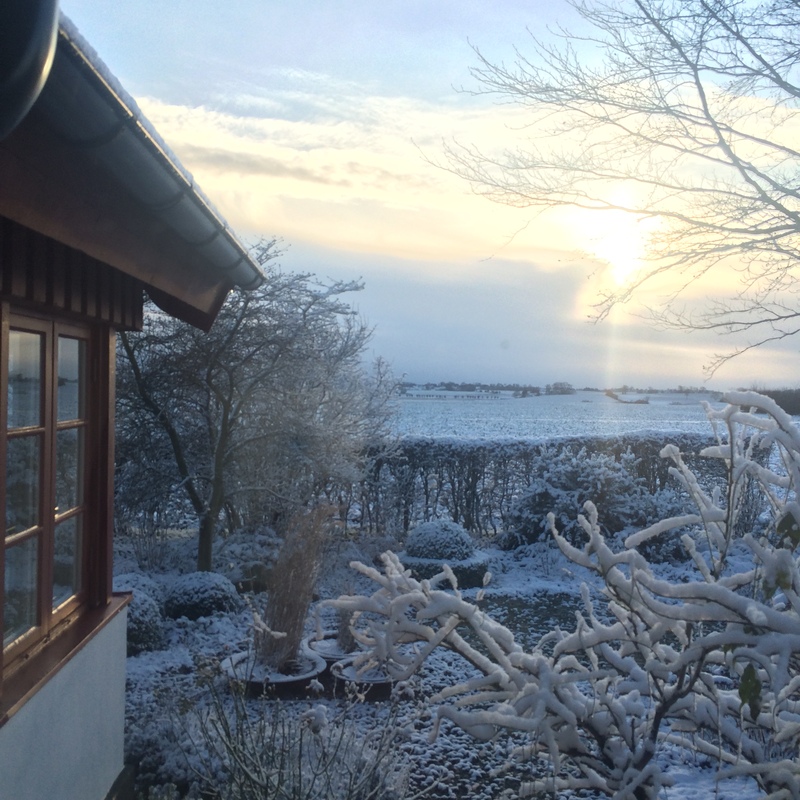 I had two weeks off work during Christmas and it was wonderful spending that much time back home in Sweden. There was a lot of food involved as we entertained and saw friends often for a meal. At the moment I’m more in the mood for soups and vegetables than three course meals (who knew I would ever utter those words), but I fondly look back on all the nice meals we had during the Christmas break. We only had traditional Christmas food on Christmas Eve, and we decided that was the perfect amount for our family. The traditional dishes are all rich and stodgy so one day is enough! 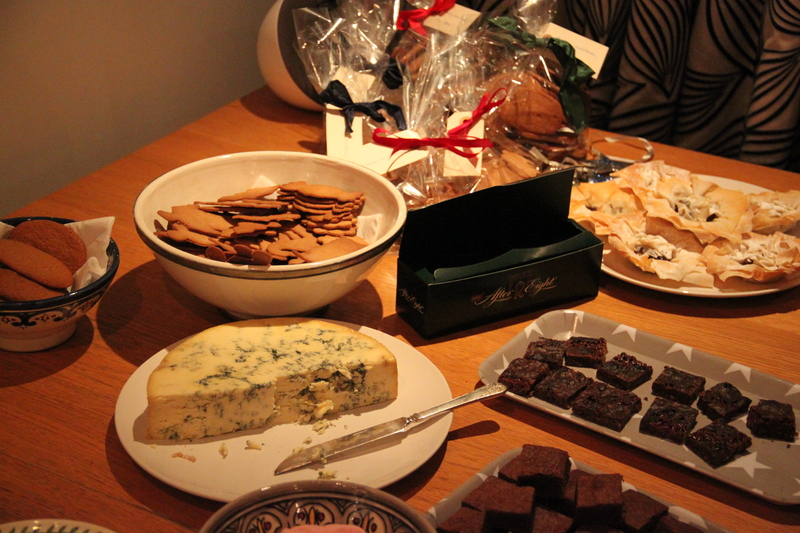 In the evening we started with a smörgåsbord of cured and smoked salmon, meatballs and sausages, Jansson’s temptation, Christmas ham, brown and red cabbage, bread and cheeses. Thereafter we had salted ling with a warm mustard sauce and boiled potatoes (although I had cod instead) and a seriously rich rice pudding (Ris a’la Malta) with plenty of whipped cream and berry sauce to finish. The other days we enjoyed whatever we were in the mood for. Mummy made this gubbröra on toast as a starter one day. 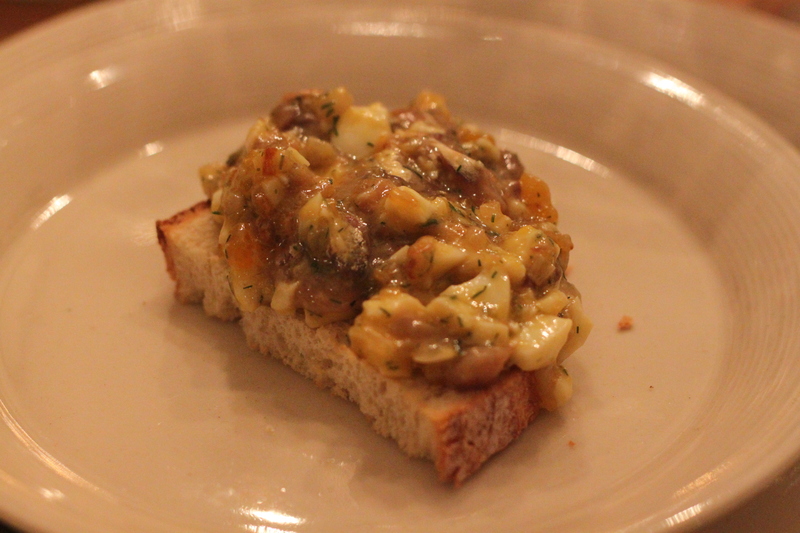 It’s chopped eggs, anchovies, dill and onions in butter. Very yummy! (Recipe to follow). 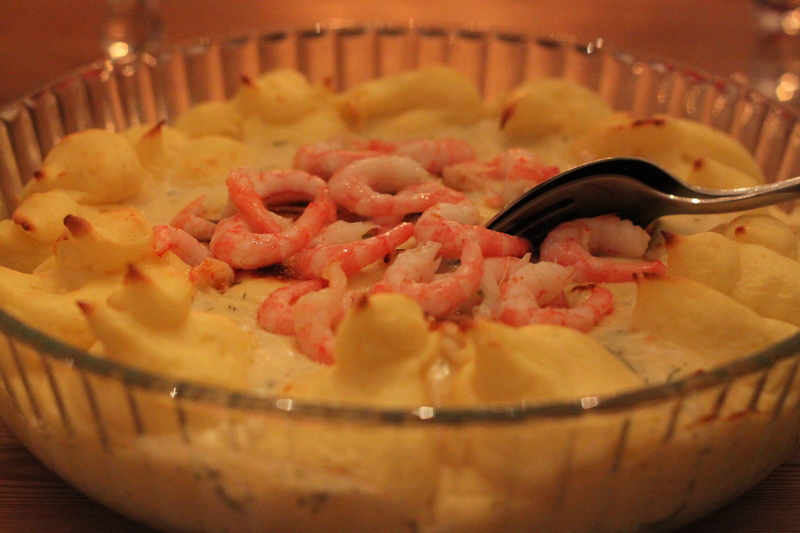 We actually had a lot of fish, like this gratin with plaice fillets and prawns. But also a lot of meat, sauce and potatoes. 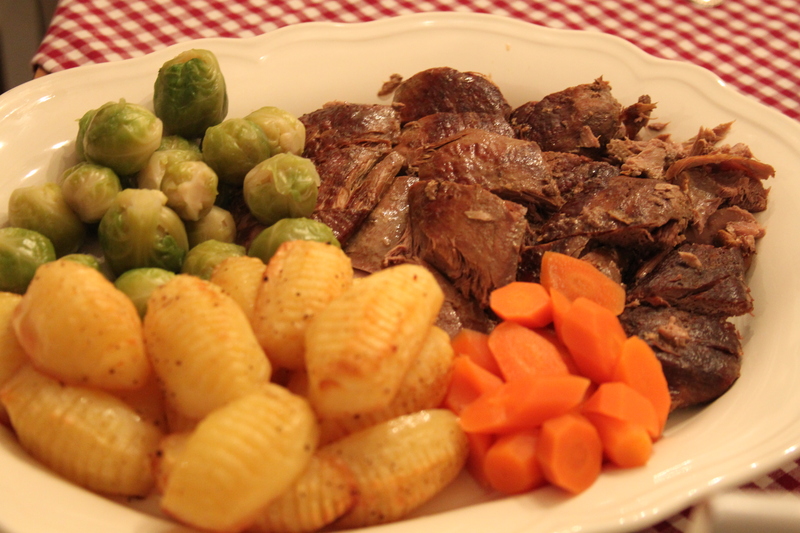 Above seriously tender wild duck cooked by mummy with Hasselback potatoes and Brussel sprouts but we also had rib-eye and bearnaise sauce as well as roasted chicken. 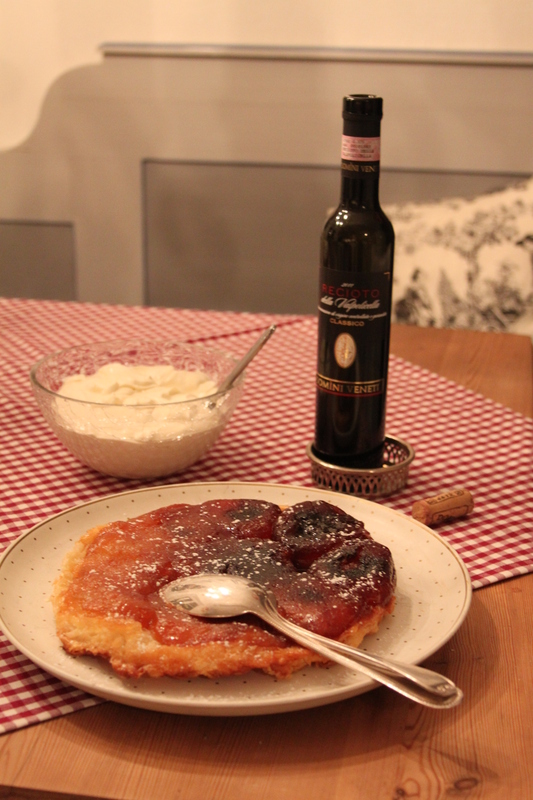 While entertaining we of course had puddings too, like this favourite tarte tatin with ‘raw’ custard. The oven cooks a bit unevenly and we forgot to move it around, hence the colour difference, but it was still very delicious! 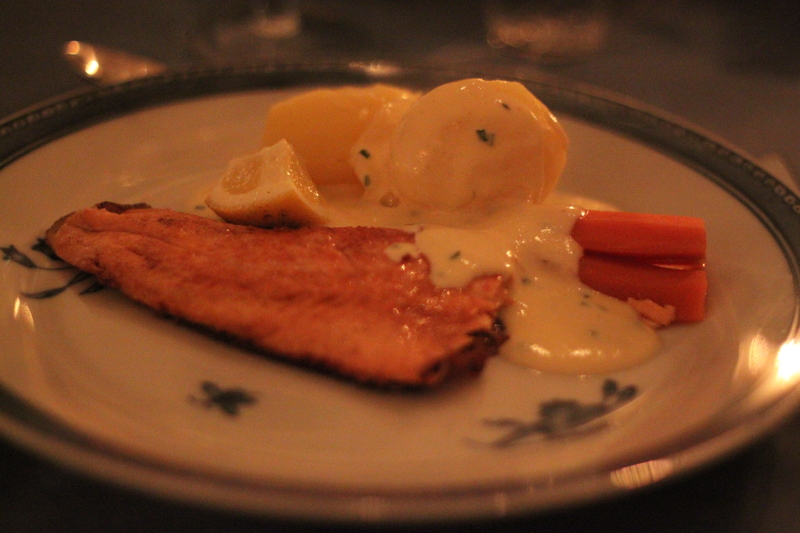 One of the last days we had some more fish as not much can beat fried Arctic char fillets with boiled potatoes and the best sauce for fish ever! A few days before Christmas and New Year we even had snow, and although I’m not a fan of icy roads and cold temperatures, the garden looked rather pretty clad in white. Hope you all had a wonderful Christmas break. Happy New Year!